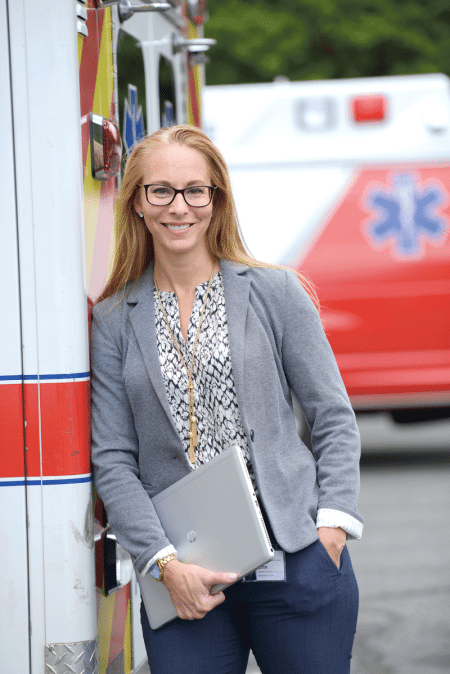 Almost from the first moment she stepped into the emergency room at Cooley Dickinson Hospital as a nursing student at UMass Amherst, Erin Daley knew this was the environment in which she wanted to work — and maybe spend a career. These sentiments are reflected in the way Daley talked about everything from a much-needed return to the ER at CDH after a stint as a telemetry nurse at Baystate Medical Center to broaden her horizons, as she put it — “even though I learned a ton, I knew labor and delivery were not for me and I needed to get to the ER” — to the enthusiastic manner in which she relayed her affection for the work involved with being a ‘charge nurse’ in the ED at Mercy Medical Center. And her affection for this setting was clearly evident when she talked about how much she misses being directly on the front lines, if you will, in her current role as director of Emergency Services at Mercy. But while there is that drawback to her current position, if one chooses to call it that, there are nonetheless many different kinds of rewards — everything from orchestrating strong improvements in the overall efficiency of the Mercy ER to working with a host of other players to help stem the tide of the nation’s opioid crisis. For her achievements in all these realms, Daley was the top scorer amid a strong field of candidates within the Emerging Leader category for these inaugural Healthcare Heroes Awards. • Improved employee-engagement scores by 33%. However, words and phrases are needed to convey how all this was accomplished — phrases like ‘whole-person care,’ used to describe an approach that views health for ED patients as a segue into engaging them in better health — and ‘care map,’ an aptly named initiative that charts a course for individual patients, especially frequent visitors to the ER. First, though, some words and phrases from Doreen Fadus, vice president of Mission Integration and Community Health at Mercy Medical Center, who nominated Daley, are in order. As she talked about her staff’s efforts in the broad realm off efficiency, or process improvement, Daley told BusinessWest that they are driven largely by necessity. 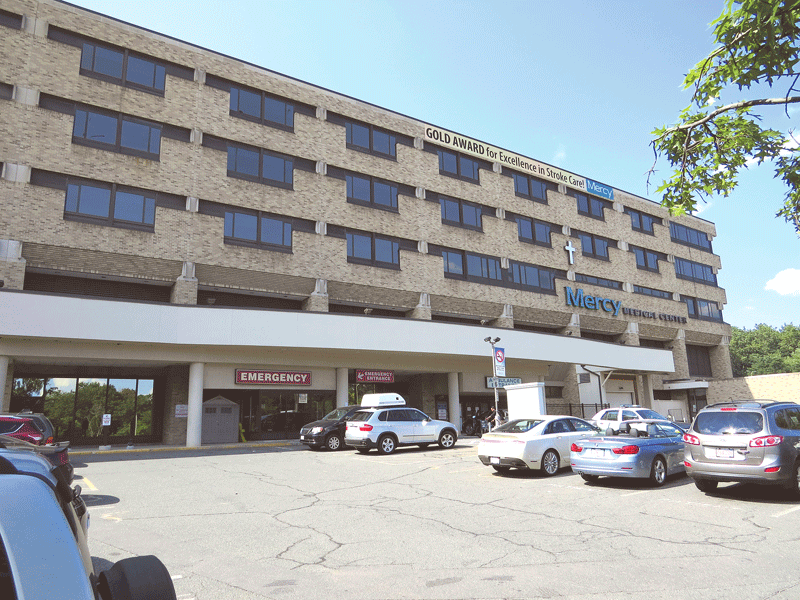 Indeed, the Mercy ED has 36 beds (just over one-third the number at Baystate Medical Center, by way of comparison), which she described as both a blessing and a curse. “We’re very spacially constrained considering the volume that we have — 36 beds for just shy of 80,000 patients,” she explained. “That’s driven us to be so efficient; it’s made us relook at how we do things, look at our data all the time, and undertake process-improvement initiatives, because we don’t have the luxury of having a lot of beds. How Daley came to be directing these efforts at improved efficiency is an intriguing story, one of moving progressively higher in the ranks in terms of responsibility within that environment she came to love. After her stint at CDH, she came to the Mercy ED in 2004. She told BusinessWest she was attracted by its reputation for being a nurse-driven environment, a description she found to be certainly accurate, and a foundation she would only build upon. She started as a staff nurse, taking care of patients at the bedside, and remained in that role for eight years, eventually assuming charge-nurse duties, which, as noted earlier, she found quite rewarding. “It’s probably my favorite job,” she said. “You’re really trying to manage throughput, and it’s a gigantic puzzle with all these moving parts. It’s about how you have to think about the ED; there’s a certain number of beds, ‘X’ amount of patients you’re trying to get through, you’re trying to allocate resources and potentially pull resources from one area to another area to always have throughput in mind, with the patient at the center of it all. In 2010, Daley became clinical nurse supervisor in the Mercy ED, and in that role was directly responsible for the supervision of the department, with specific duties ranging from staffing to scheduling; from compliance to being what she called a “real-time resource,” meaning she was still in the trenches. In 2015, she became nurse manager of the ED, assuming responsibility for productivity and throughput metrics. And just over a year ago, she was named director of Emergency Services, meaning oversight of the department and all its personnel and not being in the trenches, as she noted earlier. But it does mean bringing a higher level of efficiency to those front lines, while also bringing new meaning to the notion that the ED is a hospital’s ‘front door’ and a resource for the community beyond emergency care. “I want to know what’s happening in the community and how I can be a supporting influence,” said Daley, noting that she is involved with everything from the region’s opioid task force to a committee battling human trafficking. That phrase ‘supporting influence’ gets to the heart of both Daley’s management style and the philosophy that she and her staff members embrace when it comes to what an ED should be and how it should function. And as for the latter, she said the ED cannot only be a place to receive emergency care. 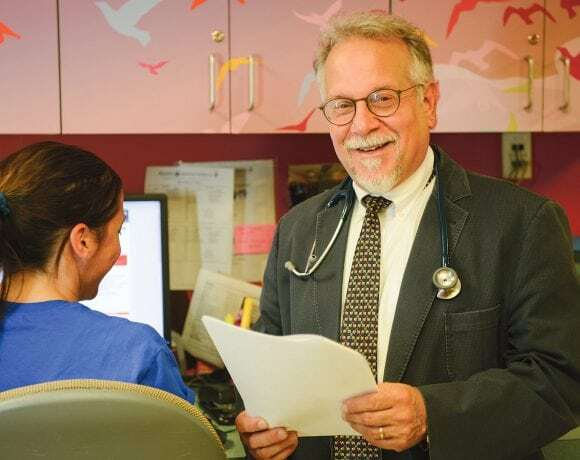 In the whole-person-care model, it is also a vehicle for engaging individuals in better health, through such things as medication-management discussions, assistance with setting up post ED visit primary care, behavioral-health services, and more. As an example, she cited the drug-overdose victim who arrives at the emergency room. Elaborating, she said those in the ED, through the unit’s Complex Care program, strive to be more proactive with those who overdose, for example, and not simply treat them and move them through. Erin Daley says her management style encourages teamwork and solving common problems together. As noted earlier, there are many numbers, or metrics, involved with an emergency department, and all through her career and especially in her current capacity, Daley has been involved with bringing specific numbers higher or lower — whichever translates into improvement. In the case of patient satisfaction, an upward trajectory is obviously desired, while, when it comes to the ‘left without being seen’ category, downward movement is the goal, because individuals are leaving generally out of frustration with the time they’re spending in the ER waiting room. And when they leave, valuable revenue is lost, and, more importantly, these individuals may be endangering their health. To achieve improvement in that ‘left without being seen’ category, and all others, the Mercy team embodies ‘lean’ strategies commonly used on the manufacturing floor and other settings, said Daley, adding that the goal is always to remove waste and improve efficiency. But while doing so, patient care cannot be compromised. And Mercy has managed to do this with what is perhaps the most-watched ER statistic, the one focused on door-to-door time (from when they check in until they are discharged), which Mercy has managed to reduce by nearly an hour — 57 minutes to be exact — to 157 minutes. Elaborating, she said the ED took one of its triage rooms and created the aptly named ‘rapid medical exam’ (RME) room. There, patients deemed to be low-acuity are triaged, seen by a provider, and discharged, all from that one room. 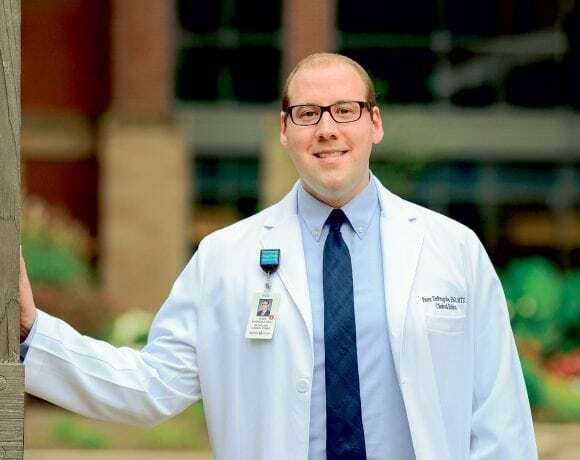 “If all of those patients that are of that lower acuity never hit the back of the ER and never take up a bed, you increase your capacity for sicker patients,” Daley explained. “You increase capacity, not because you’ve added beds, but because you’ve added bed hours. “When we piloted this on our busiest days, it was incredibly successful, and over the next few years, we went from Monday and Tuesday to Monday through Friday, and then, as our volumes grew, we expanded it to every day of the week,” she explained, adding that the RME model has also had a huge impact on the ‘left without being seen’ numbers as well, because of the additional bed space. These improvements have come about through that lean approach to operations, learning from best practices, and working together as a team to solve problems and achieve continuous improvement, said Daley, adding that her management style encourages all this. 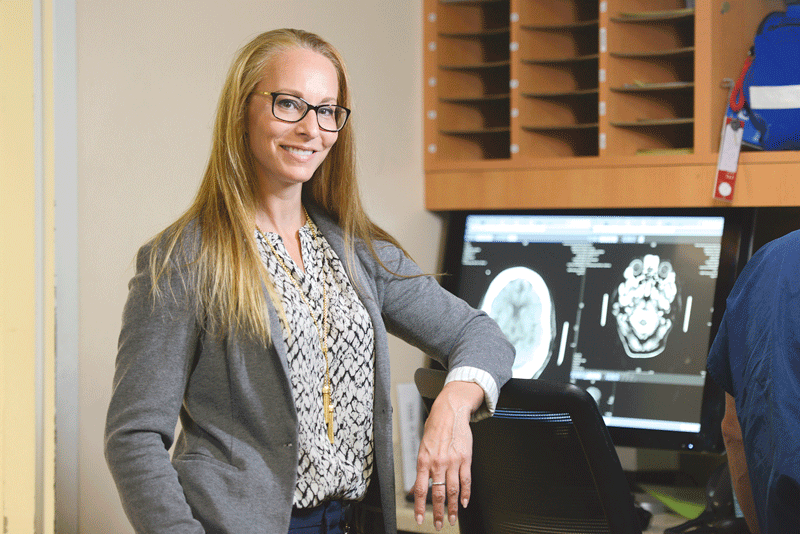 “I’m successful because I have an amazing team of people that I work with — everyone who’s in a leadership capacity in this department is an over-achiever and a go-getter,” she noted. “I’m not the kind of person who micromanages at all; I like to be collaborative and make a goal together. Looking ahead, Daley, now pursuing an MBA at Elms College, is focused on building upon both her leadership skills and her grasp of the many financial aspects of her position and others within the higher ranks of healthcare management. “I want to be very knowledgeable about how my business, meaning my department, runs, and feel confident about that,” she explained. “From there … I’m not quite sure what the future holds. For now, she will continue to oversee the air-traffic controllers and others in the ED, create more process improvements, and, in general, go on being a ‘supportive influence’ — there’s that phrase again — with her staff, in the ED, and within the community she serves. As Doreen Fadus noted, Daley is both an emerging leader and an energetic administrator who has, in many ways, already emerged.